Well here it is, my first batch fermented with nothing but wild yeast (well at least it used to be wild before White Labs got ahold of it, stuck it in a test tube and sent it to me). Brettanomyces (Brett) was originally discovered and recognized as an important flavor contributor in the late 19th century in barrels of Stock Ale in England. Since then it has been identified as an important component in beers such as Orval, Rodenbach and any Lambic you can name. It has the ability to break down some long change starches that (Saccharomyces, brewers yeast) cannot. But despite this advantage it is slow moving and thus generally relegated to scavenging the scraps left over after the primary fermentation. Thus came the idea from breweries like Pizza Port and Russian River, "Why not let Brett take the lead and ferment a wort of its own?" Not only did these two breweries prove their point that Brett can be used as the sole fermenter but also through their craftsmanship they proved that it could make some outstanding beers. Pizza Port was first with Mo' Betta Bretta which used Brettanomyces claussenii and got an acidity boost from having a portion of the wort soured by lactobacillus while the rest of the wort boiled. Russian River used bruxellensis and lambicus along with lactobacillus in the fermenter. My batch was inspired by a comparative yeast test done by a homebrewer named Sebastian on the BBB. It uses Brettanomyces claussenii, descended from that original strain found in stock ale and the least funky of the Brett strains. It is known for being more fruity and less goaty than the two strains more common in Belgian breweries bruxellensis and lambicus. It was also fermentened with ambient temperatures in the low 80s, which is much higher than you would ferment almost any brewing yeast with the exception of the Saison Dupont strain. 0.50 oz. Sterling @ 50 min. 0.25 oz. Mt. Hood @ 10 min. 0.25 oz. Mt. Hood @ 5 min. 0.25 oz. Sterling @ 5 min. 0.25 oz. Mt. Hood @ 0 min. 0.25 oz. Sterling @ 0 min. 12/4/06 1 pint starter made with 2 oz DME. Put into dark closet. 1/4/07 stepped up to about 1/2 gallon and added 1/2 tsp chalk to counter some of the acidity. 1/19/07 Put starter into fridge to crash out remaining yeast for brew day. Batch sparged and collected 5 gallons of 1.029 (67% eff) runoff. Not sure why I keep getting crap efficiency on low abv beers. I subbed in sterling for the Chinook, I just don't want that harsh bitterness. Pitched around 80 degrees and left in an 82ish degree room. Gave the fermenter a few quick shakes over the first 18 hours, wanted some oxygen, but too much increases the acidity a lot. By 20 hours from pitching a 1/4 inch krausen had formed. 1/23/07 After getting to a 3/4 inch krausen by day 2 the Krausen has pretty much fallen except for a dark scummy layer. Not sure if that will fall soon, or a pellicle will remain indefinitely. 1/24/07 1.012 (75.5% AA) Yeast seems to be finished, quickly flocc'ing out. Doesn't taste too funky, it has some peach and a slight tartness. 1/29/07 Getting pretty clear, still a bit of sparse foam on top. 2/17/07 Down about 1 point to 1.009, getting really nice and fruity. Looks like there isn't much more fermenting to be done, should be ready to bottle soon. 2/19/07 Added a couple of grams of US-56 dry yeast to one of the jugs. I wanted to add it a few days before bottling in case it was able to eat a point or two of sugar that the Brett could not. I want to see how the traditional yeast affects the carbonation process and if it will alter how the beer ages. 2/22/07 Bottled, in two weeks I will crack some bottles and see if the batch that got US-56 got carbonated faster and if it tastes any different. 2/25/07 Got impatient and took out a bottle of the US-56 spiked batch. Moderate carbonation, very fruity. Still not very tart, and the yeast made it taste muddier than it had the last time I tasted it. 3/3/07 The straight Brett batch is pretty nicely carbonated. The flavor is great, lemons, lightly tart, clean, fruity. Pretty clear until the second pour when the yeast gets stirred up (Brett doesn't flocculate as well as most Saccharomyces). Should be really good in another few weeks once full carbonation is reached. Thanks for the follow-through info on the 100% Brett beer! You're absolutely right, there are way too few recipes that give after-brew tasting information, so it can be a crap shoot. Your info was very helpful to me as I impulsively today made a similar brew from some additional runnings from an IPA. I also enjoy the BBB very much, and post there as ErikH. See your info there some time? Are you participating perhaps in one of the Brett swaps there? Yeah I'm in the first one (Mike T), I think I'm going to send my Mo' Betta Bretta clone with cherries and wine. Really excited about it, but also pretty nervous to have people tasting my beer who are so much more experience than me at brewing Brett beers (not to mention Tomme). I was considering dumping some Brett slurry into the second runnings from an Imperial Stout 2 weeks ago, but decided against it for some reason. Let me know how yours turns out. I'm planning a 100% brett L brew. Is there anything you might change when doing this again? I don't think there was much difference between the two, although this is going back a few years. Not much I would change, this was probably the best batch of 100% Brett beer I made. Not sure if L would do well at elevated temps, but I have never used it as the primary strain. Great site man - you've helped me out a lot! I'm guessing you used the White Labs Brett L, the Wyeast tends to be fruitier. What was your carbonation recipe? Is it necessary to add priming sugar like regular ales or is there still enough for the Brett to eat to sufficiently carbonate without adding a priming sugar? I (pretty much) always wait until the gravity is stable before bottling. In that case you prime with exactly the same amount of sugar as you would for a clean beer. Some brewers add Brett at bottling and count on some additional attenuation to boost the carbonation, but this is really risky if you aren't positive what the FG will be. Good luck, 100% Brett is a great way to start with funk. I have a Berliner Weiss that I soured with Delbrueckii and then pitched some Brett Clausenii into. I stepped up a starter from a vial into 1 litre, then a few weeks later added that into a 2 liter starter. Everythign looked good so pitched that into the Berliner SG of 1.040. A pellicle formed but not a huge amount of action and now two weeks later absolutely no shift in the gravity. I notice you used quite a large starter, have I just grossly under pitched? PH is around 3.8 so that shouldnt be an issue….First time Ive used any Brett so not sure what to expect, but from your posts its clear that this situation isn't normal. Im thinking of adding in some regular sachromyces to ferment this thing out before it spoils. Keen to hear your thoughts? This is the second recipe I am brewing from your book! I prepared the wort yesterday and pitched the yeast after injecting 1,5min pure oxygen @ 63F (17c). I went for a lager like pitching rate so I did a twostep starter (1,5L each) out of a WLP645. (around 350 billion cells). By mistake (rookie mistake) I left the temperature @63F (17c) for the entire night (10 hours). When I woke up this morning the airlock was already bubbling. When I realised my mistake I started to raise the temp. I am guessing that to get to 80F (which the temp you recommend in the book) it will take me the best part of this day (30 hours since pitch temp). 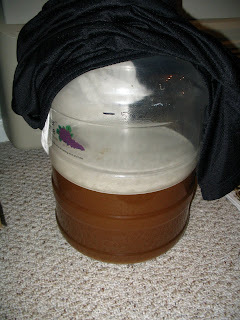 As heat source I am using a germination pad wrapped around my bucket which is placed in my fermentation fridge. As the lag phase determines to a large extent the fermentation character I am worried that I will end up making a rather clean been, lucking in the brett character (fruit and funkiness). Also is there a risk from a raising the temp from 63F to 80F over 24 hours?? I think it'll be delicious! I haven't done that temperature profile with that strain, so the specific differences (if any) compared to starting warmer would just be speculation. The yeast likely heated the beer up above 63 on their own as fermentation started.